BMW Motorrad range starts at INR 2.99 lakh, all thanks to the launch of G310R in India. The entry-level streetfighter is good for 34HP of maximum power and shares platform with G310GS. The jump from single to multi-cylinder motorcycle range is huge, bringing F750GS to the buyers for INR 11.95 lakh. Soon after this, the range goes another step higher with R1200R for INR 15.05 lakh. 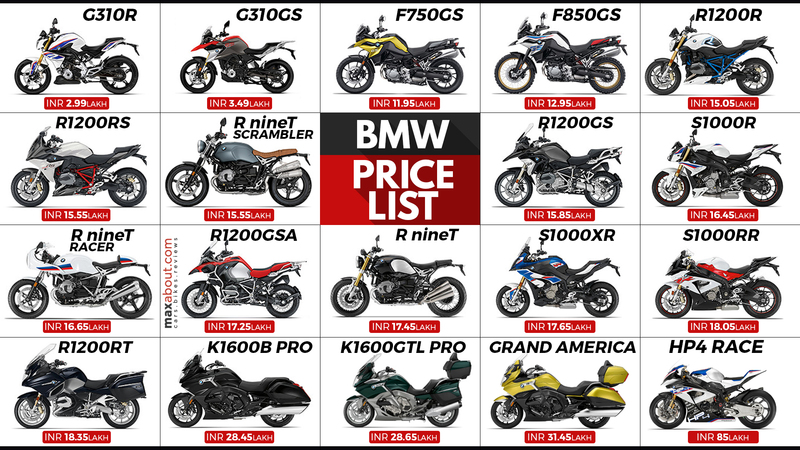 BMW Motorrad has a total of 19 models in their Indian lineup, differentiated with body styles like adventure, street, supersport, and sport. The mighty HP4 Race is the most expensive BMW motorcycle, retailing for INR 85 lakh and using carbon fiber for lightweight construction. The K-series of motorcycles are available with 6-cylinder engine option while 1000 in the name depicts four-cylinder, liter-class engine on BMW bikes. A unique R NineT range with three variants is also available from BMW Motorrad India.